This article is about composers of music. For other uses, see Composer (disambiguation). A composer (Latin compōnō; literally "one who puts together") is a musician who is an author of music in any form, including vocal music (for a singer or choir), instrumental music, electronic music, and music which combines multiple forms. A composer may create music in any music genre, including, for example, classical music, musical theatre, blues, folk music, jazz, and popular music. Composers often express their works in a written musical score using musical notation. Many composers are, or were, also skilled performers of music. Musical notation serves as a set of directions for a performer, but there is a whole continuum of possibilities concerning how much the performer determines the final form of the rendered work in performance. Even in a conventional Western piece of instrumental music, in which all of the melodies, chords, and basslines are written out in musical notation, the performer has a degree of latitude to add artistic interpretation to the work, by such means as by varying his or her articulation and phrasing, choosing how long to make fermatas (held notes) or pauses, and — in the case of bowed string instruments, woodwinds or brass instruments — deciding whether to use expressive effects such as vibrato or portamento. For a singer or instrumental performer, the process of deciding how to perform music that has been previously composed and notated is termed "interpretation". Different performers' interpretations of the same work of music can vary widely, in terms of the tempos that are chosen and the playing or singing style or phrasing of the melodies. Composers and songwriters who present their own music are interpreting, just as much as those who perform the music of others. The standard body of choices and techniques present at a given time and a given place is referred to as performance practice, whereas interpretation is generally used to mean the individual choices of a performer. Although a musical composition often has a single author, this is not always the case. A work of music can have multiple composers, which often occurs in popular music when a band collaborates to write a song, or in musical theatre, where the songs may be written by one person, the orchestration of the accompaniment parts and writing of the overture is done by an orchestrator, and the words may be written by a third person. A piece of music can also be composed with words, images, or, in the 20th and 21st century, computer programs that explain or notate how the singer or musician should create musical sounds. Examples of this range from wind chimes jingling in a breeze, to avant-garde music from the 20th century that uses graphic notation, to text compositions such as Aus den sieben Tagen, to computer programs that select sounds for musical pieces. Music that makes heavy use of randomness and chance is called aleatoric music, and is associated with contemporary composers active in the 20th century, such as John Cage, Morton Feldman, and Witold Lutosławski. The nature and means of individual variation of the music is varied, depending on the musical culture in the country and time period it was written. For instance, music composed in the Baroque era, particularly in slow tempos, often was written in bare outline, with the expectation that the performer would add improvised ornaments to the melody line during a performance. Such freedom generally diminished in later eras, correlating with the increased use by composers of more detailed scoring in the form of dynamics, articulation et cetera; composers becoming uniformly more explicit in how they wished their music to be interpreted, although how strictly and minutely these are dictated varies from one composer to another. Because of this trend of composers becoming increasingly specific and detailed in their instructions to the performer, a culture eventually developed whereby faithfulness to the composer's written intention came to be highly valued (see, for example, Urtext edition). This musical culture is almost certainly related to the high esteem (bordering on veneration) in which the leading classical composers are often held by performers. The historically informed performance movement has revived to some extent the possibility of the performer elaborating in a serious way the music as given in the score, particularly for Baroque music and music from the early Classical period. The movement might be considered a way of creating greater faithfulness to the original in works composed at a time that expected performers to improvise. In genres other than classical music, the performer generally has more freedom; thus for instance when a performer of Western popular music creates a "cover" of an earlier song, there is little expectation of exact rendition of the original; nor is exact faithfulness necessarily highly valued (with the possible exception of "note-for-note" transcriptions of famous guitar solos). In Western art music, the composer typically orchestrates his or her own compositions, but in musical theatre and in pop music, songwriters may hire an arranger to do the orchestration. In some cases, a pop songwriter may not use notation at all, and instead compose the song in his or her mind and then play or record it from memory. In jazz and popular music, notable recordings by influential performers are given the weight that written scores play in classical music. The study of composition has traditionally been dominated by examination of methods and practice of Western classical music, but the definition of composition is broad enough the creation of popular and traditional music songs and instrumental pieces and to include spontaneously improvised works like those of free jazz performers and African percussionists such as Ewe drummers. The level of distinction between composers and other musicians varies, which affects issues such as copyright[specify] and the deference given to individual interpretations of a particular piece of music. In the development of European classical music, the function of composing music initially did not have much greater importance than that of performing it. The preservation of individual compositions did not receive enormous attention and musicians generally had no qualms about modifying compositions for performance. In as much as the role of the composer in western art music has seen continued solidification, in alternative idioms (i.e. jazz, experimental music) it has in some ways become increasingly complex or vague. For instance, in certain contexts the line between composer and performer, sound designer, arranger, producer, and other roles, can be quite blurred. The term "composer" is often used to refer to composers of instrumental music, such as those found in classical, jazz or other forms of art and traditional music. In popular and folk music, the composer is usually called a songwriter, since the music generally takes the form of a song. Since the mid-20th century, the term has expanded to accommodate creators of electroacoustic music, in which composers directly create sonic material in any of the various electronic media, such as reel-to-reel tape and electronic effects units, which may be presented to an audience by replaying a tape or other sound recording, or by having live instrumentalists and singers perform with prerecorded material. This is distinct from a 19th-century conception of instrumental composition, where the work was represented solely by a musical score to be interpreted by performers. Music was an important part of social and cultural life in Ancient Greece. We know that composers wrote notated music during the Ancient Greek era because scholars have found the Seikilos epitaph. The epitaph, written around 200 BC to around AD 100  is the oldest surviving example of a complete musical composition, including musical notation, in the world. The song, the melody of which is recorded, alongside its lyrics, in the ancient Greek musical notation, was found engraved on a tombstone, a stele, near Aydın, Turkey (not far from Ephesus). It is a Hellenistic Ionic song in either the Phrygian octave species or Iastian tonos. During the Medieval music era (476 to 1400), composers wrote monophonic (single melodic line) chanting into Roman Catholic Church services. Western Music then started becoming more of an art form with the advances in music notation. The only European Medieval repertory that survives from before about 800 is the monophonic liturgical plainsong of the Roman Catholic Church, the central tradition of which was called Gregorian chant. Alongside these traditions of sacred and church music there existed a vibrant tradition of secular song (non-religious songs). Examples of composers from this period are Léonin, Pérotin and Guillaume de Machaut. 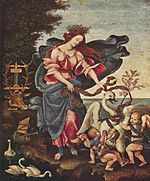 During the Renaissance music era (c. 1400 to 1600) composers tended to focus more on writing songs about secular (non-religious) themes, such as courtly love. Around 1450, the printing press was invented, which made printed sheet music much less expensive and easier to mass-produce (prior to the invention of the printing press, all notated music was hand-copied). The increased availability of sheet music helped to spread composers' musical styles more quickly and across a larger area. By the middle of the 15th century, composers were writing richly polyphonic sacred music, in which different melody lines were interwoven simultaneously. Prominent composers from this era include Guillaume Dufay, Giovanni Pierluigi da Palestrina, Thomas Morley, and Orlande de Lassus. As musical activity shifted from the church to the aristocratic courts, kings, queens and princes competed for the finest composers. Many leading important composers came from the Netherlands, Belgium, and northern France. They are called the Franco-Flemish composers. They held important positions throughout Europe, especially in Italy. Other countries with vibrant musical activity included Germany, England, and Spain. During the Baroque era of music (1600 to 1750), composers expanded the range and complexity of the music they were writing. The Baroque music era began when composers looked back to Ancient Greek music for the inspiration to create operas (dramatic vocal music accompanied by orchestra). Another key style of music composers used during this era was contrapuntal music. This style of writing required composers to have an advanced knowledge of music theory, as contrapuntal music involves multiple, independent melody lines played by instruments or sung by voices. There were strict counterpoint rules that composers had to learn. German Baroque composers wrote for small ensembles including strings, brass, and woodwinds, as well as choirs and for keyboard instruments such as pipe organ, harpsichord, and clavichord. During this period, composers developed several major music forms that lasted into later periods when they were expanded and evolved further, including the fugue, the invention, the sonata, and the concerto. The late Baroque style was polyphonically complex and richly ornamented. Some of the best-known composers from the Baroque era include Claudio Monteverdi, Heinrich Schütz, Jean-Baptiste Lully, Dieterich Buxtehude, Arcangelo Corelli, Henry Purcell, François Couperin, Antonio Vivaldi, Georg Philipp Telemann, Jean-Philippe Rameau, Johann Sebastian Bach and George Frideric Handel. Composers of music of the Classical Period (1750 to 1830) looked to the art and philosophy of Ancient Greece and Rome, to the ideals of balance, proportion and disciplined expression. Apart from when writing religious works, composers moved towards writing in a lighter, clearer and considerably simpler texture, using instrumental melodies that tended to be almost voicelike and singable. New genres were developed by composers. The main style was homophony, where a prominent melody and a subordinate chordal accompaniment part are clearly distinct. Composers focused on instrumental music. It was dominated by further development of musical forms initially defined in the Baroque period: the sonata, the concerto, and the symphony. Others main kinds were the trio, string quartet, serenade and divertimento. The sonata was the most important and developed form. Although Baroque composers also wrote sonatas, the Classical style of sonata is completely distinct. All of the main instrumental forms of the Classical era, from string quartets to symphonies and concertos, were based on the structure of the sonata. The best known composers of Classicism are Joseph Haydn, Wolfgang Amadeus Mozart, Ludwig van Beethoven and Franz Schubert. Beethoven and Schubert are also considered to be composers in the later part of the Classical era, as it began to move towards Romanticism. During the Romantic music era (c. 1810 to 1900), composers turned the rigid styles and forms of the Classical era into more passionate, dramatic expressive pieces. Composers attempted to increase emotional expression and power of their music, and they tried to describe deeper truths or human feelings. With symphonic tone poems, composers tried to tell stories and evoke images or landscapes using instrumental music. Some composers promoted nationalistic pride with patriotic orchestral music inspired by folk music. For composers, the emotional and expressive qualities of music came to take precedence over following textbooks and tradition. Romantic composers grew in idiosyncrasy, and went further in the syncretism of exploring different art-forms in a musical context, (such as literature), history (historical figures and legends), or nature itself. Romantic love or longing was a prevalent theme in many works composed during this period. In some cases the formal structures from the classical period continued to be used (e.g., the sonata form used in string quartets and symphonies), but these forms were expanded and altered. In many cases, composers explored new approaches to use for existing genres, forms, and functions. Also, composers created new forms that were deemed better suited to the new subject matter. Opera and ballet continued to develop. In the years after 1800, the music developed by Ludwig van Beethoven and Franz Schubert introduced a more dramatic, expressive style. In Beethoven's case, short motifs, developed organically, came to replace melody as the most significant compositional unit (an example is the distinctive four note figure used in his Fifth Symphony). Later Romantic composers such as Pyotr Ilyich Tchaikovsky, Antonín Dvořák, and Gustav Mahler used more unusual chords and more dissonance to create dramatic tension. They generated complex and often much longer musical works. During the late Romantic period, composers explored dramatic chromatic alterations of tonality, such as extended chords and altered chords, which created new sound "colours". Composers in the Romantic era increased the size of the orchestra by adding players and using new instruments, creating a more powerful sound. Some Wagnerian orchestras included multiple harps, massive string sections and Wagner tubas. In the 19th century, one of the key ways that new compositions became known to the public was by the sales of sheet music, which amateur music lovers would perform at home on their piano or other instruments. With 20th-century music, there was a vast increase in music listening as the radio gained popularity and phonographs were used to replay and distribute music. 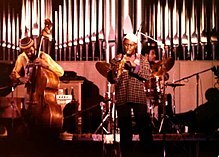 In the 20th century, contemporary classical composers were also influenced by the African-American improvisation-based jazz music. The jazz influence can be seen in Third Stream music and in the compositions of Leonard Bernstein. The focus of art music was characterized by exploration of new rhythms, styles, and sounds. Igor Stravinsky, Arnold Schoenberg, and John Cage were all influential composers in 20th-century art music. Cage wrote compositions for traditional classical instruments and unusual sound-producing devices not normally thought of as instruments, such as radios. The invention of sound recording and the ability to edit music on tape gave rise to new subgenre of classical music, including the acousmatic and Musique concrète schools of electronic composition, in which composers made pieces using reel-to-reel tape recorders and electronic equipment. In 1993, American musicologist Marcia Citron asked "[w]hy is music composed by women so marginal to the standard 'classical' repertoire?" Citron "examines the practices and attitudes that have led to the exclusion of women composers from the received 'canon' of performed musical works." She argues that in the 1800s, women composers typically wrote art songs for performance in small recitals rather than symphonies intended for performance with an orchestra in a large hall, with the latter works being seen as the most important genre for composers; since women composers did not write many symphonies, they were deemed to be not notable as composers. According to Abbey Philips, "women musicians have had a very difficult time breaking through and getting the credit they deserve." During the Medieval eras, most of the art music was created for liturgical (religious) purposes and due to the views about the roles of women that were held by religious leaders, few women composed this type of music, with the nun Hildegard von Bingen being among the exceptions. Most university textbooks on the history of music discuss almost exclusively the role of male composers. As well, very few works by women composers are part of the standard repertoire of classical music. In the Concise Oxford History of Music, Clara Schumann is the only woman composer who is mentioned. Philips states that "[d]uring the 20th century the women who were composing/playing gained far less attention than their male counterparts." Women today are being taken more seriously in the realm of concert music, though the statistics of recognition, prizes, employment, and overall opportunities are still biased toward men. Famous composers have a tendency to cluster in certain cities throughout history. Based on over 12,000 prominent composers listed in Grove Music Online and using word count measurement techniques, the most important cities for classical music can be quantitatively identified. Paris has been the main hub for classical music in all periods. It was ranked fifth in the 15th and 16th centuries but first in the 17th to 20th centuries inclusive. London was the second most meaningful city: eighth in the 15th century, seventh in the 16th, fifth in the 17th, second in the 18th and 19th centuries, and fourth in the 20th century. Rome topped the rankings in the 15th century, dropped to second in the 16th and 17th centuries, eighth in the 18th century, ninth in the 19th century but back at sixth in the 20th century. Berlin appears in the top ten ranking only in the 18th century, and was ranked third most important city in both the 19th and 20th centuries. New York City entered the rankings in the 19th century (at fifth place) and stood at second rank in the 20th century. The patterns are very similar for a sample of 522 top composers. Professional classical composers often have a background in performing classical music during their childhood and teens, either as a singer in a choir, as a player in a youth orchestra, or as a performer on a solo instrument (e.g., piano, pipe organ, or violin). Teens aspiring to be composers can continue their postsecondary studies in a variety of formal training settings, including colleges, conservatories, and universities. Conservatories, which are the standard musical training system in France and in Quebec (Canada) provide lessons and amateur orchestral and choral singing experience for composition students. Universities offer a range of composition programs, including bachelor's degrees, Master of Music degrees, and Doctor of Musical Arts degrees. As well, there are a variety of other training programs such as classical summer camps and festivals, which give students the opportunity to get coaching from composers. Bachelor's degrees in composition (referred to as B.Mus. or B.M) are four-year programs that include individual composition lessons, amateur orchestra/choral experience, and a sequence of courses in music history, music theory, and liberal arts courses (e.g., English literature), which give the student a more well-rounded education. Usually, composition students must complete significant pieces or songs before graduating. Not all composers hold a B.Mus. in composition; composers may also hold a B.Mus. in music performance or music theory. Master of music degrees (M.mus.) in composition consist of private lessons with a composition professor, ensemble experience, and graduate courses in music history and music theory, along with one or two concerts featuring the composition student's pieces. A Master's degree in music (referred to as an M.Mus. or M.M.) is often a required minimum credential for people who wish to teach composition at a university or conservatory. A composer with an M.Mus. could be an adjunct professor or instructor at a university, but it would be difficult in the 2010s to obtain a tenure track professor position with this degree. To become a tenure track professor, many universities require a doctoral degree. In composition, the key doctoral degree is the Doctor of Musical Arts, rather than the PhD; the PhD is awarded in music, but typically for subjects such as musicology and music theory. Doctor of Musical Arts (referred to as D.M.A., DMA, D.Mus.A. or A.Mus.D) degrees in composition provide an opportunity for advanced study at the highest artistic and pedagogical level, requiring usually an additional 54+ credit hours beyond a master's degree (which is about 30+ credits beyond a bachelor's degree). For this reason, admission is highly selective. Students must submit examples of their compositions. If available, some schools will also accept video or audio recordings of performances of the student's pieces. Examinations in music history, music theory, ear training/dictation, and an entrance examination are required. Students must prepare significant compositions under the guidance of faculty composition professors. Some schools require DMA composition students to present concerts of their works, which are typically performed by singers or musicians from the school. The completion of advanced coursework and a minimum B average are other typical requirements of a D.M.A program. During a D.M.A. program, a composition student may get experience teaching undergraduate music students. Some classical composers did not complete composition programs, but focused their studies on performance of voice or an instrument or on music theory, and developed their compositional skills over the course of a career in another musical occupation. 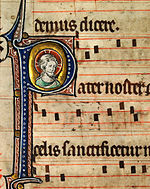 During the Middle Ages, most composers worked for the Catholic church and composed music for religious services such as plainchant melodies. During the Renaissance music era, composers typically worked for aristocratic employers. While aristocrats typically required composers to produce a significant amount of religious music, such as Masses, composers also penned many non-religious songs on the topic of courtly love: the respectful, reverential love of a great woman from afar. Courtly love songs were very popular during the Renaissance era. During the Baroque music era, many composers were employed by aristocrats or as church employees. During the Classical period, composers began to organize more public concerts for profit, which helped composers to be less dependent on aristocratic or church jobs. This trend continued in the Romantic music era in the 19th century. In the 20th century, composers began to seek employment as professors in universities and conservatories. In the 20th century, composers also earned money from the sales of their works, such sheet music publications of their songs or pieces or as sound recordings of their works. ^ "Baroque Music by Elaine Thornburgh and Jack Logan, Ph.D." trumpet.sdsu.edu. Archived from the original on 5 September 2015. Retrieved 27 October 2015. ^ "WQXR – New York's Classical Music Radio Station". WQXR. Retrieved 2016-03-23. ^ Karol Jan Borowiecki; John O'Hagan (2012). "Historical Patterns Based on Automatically Extracted Data: the Case of Classical Composers". Historical Social Research (Section 'Cliometrics'), 2012, 37(2): 298–314. Retrieved 2012-10-13. ^ John O'Hagan; Karol Jan Borowiecki (2010-07-08). "Birth Location, Migration, and Clustering of Important Composers". Historical Methods, Volume 43, Issue 2, 2010. 43 (2): 81–90. doi:10.1080/01615441003729945. Look up composer in Wiktionary, the free dictionary.